Elizabeth Thomas is a third year PhD student at the Monash Alfred Psychiatry Research Centre (MAPrc). She completed a Bachelor of Biomedical Science (First Class Honours)/Bachelor of Science double degree at Monash University in 2013. She loved the first-hand experience of clinical research from her Honours year and then decided to complete a Doctor of Philosophy (PhD), which she aims to finish next year. Her main interest is investigating the broader schizotypy/schizophrenia continuum. The schizotypy theory suggests that the personality characteristics observed in schizophrenia are observed along a continuum and can experienced to an extent by healthy individuals in the population. These high schizotypy individuals experience the symptoms of schizophrenia albeit to a milder degree. Elizabeth’s PhD project involves looking at a range of genes from the glutamatergic system and their involvement in cognition in patients across the schizotypy/schizophrenia continuum. Mainly, she looks at saccadic (eye movement) performance as a measure of cognition. Elizabeth has served on several committees, including the Students of Brain Research (SOBR) and Body Image and Related Disorders (BIRD) committees. She has also presented at numerous conferences, including internationally at the Schizophrenia International Research Society (SIRS) conference in Florence 2016 and most recently the World Congress of Psychiatric Genetics (WCPG) conference in Glasgow in October 2018. On top of this, Elizabeth received a DAAD research grant to collaborate with a well-known researcher in Germany in September this year, during which time she attended the European Summer School on Eye Movements (ESSEM) and also worked with Prof. Ulrich Ettinger at the University of Bonn, focusing on the relationship between eye movement performance and schizotypy. Elizabeth is married and has a 10 month old daughter, who she brought with her (and her husband) during her collaboration in Germany. Who and/or what inspires you to achieve? I know how difficult it is to get to coveted grants and fellowships and that has driven me to always do my absolute best. Having a young family now, I am even more determined to succeed to provide my daughter the best life and to be an inspiration for her as she grows older. Are you a science communicator? Why and how do you communicate? I am part of the CSIRO STEM Professionals in Schools, where I explain science concepts to primary school students. On top of that, I give talks at high school career days to promote STEM interests in young students. I communicate differently depending on the audience. Since I study cognition, I always get my audience to do some simple cognitive tasks to keep them engaged and get them interested! I’m at the tail-end of my parental leave right now. I knew that I would have difficulty finding spare time, so I tried to write as much as I could and submitted several manuscripts so that they could go through the review process while I was on leave. I also went to Germany for a collaboration in September, at which time my daughter was around 7 months. My husband was extremely supportive at that time and took time off work to come to Germany with us and become the full-time carer while I took advantage of the grant opportunity. 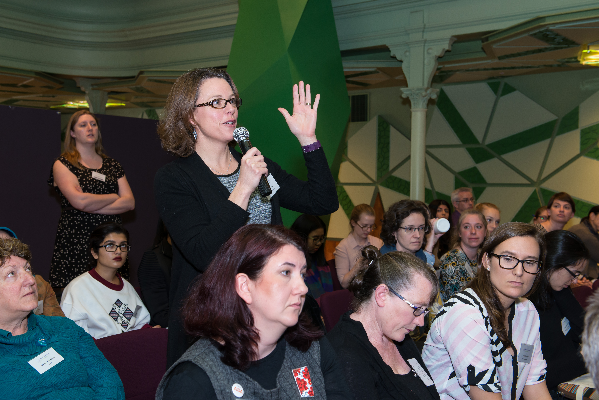 What is the biggest challenge to women pursuing a career in the STEMM sector? As a new mother, I would definitely have to say being a mum can be very limiting. As researchers, we want to advance our career by taking on available opportunities, which is very difficult to do with young kids. I was lucky that my husband was able to take time off to come to Germany with me. If he hadn’t been able to, I would have had to forgo that opportunity. Similarly, I went to Glasgow in October this year (2018) and I had to leave my daughter behind. Again, that was only possible because of my husband looking after her in Melbourne. I know conferences are starting to become more child-friendly, so that’s a step in the right direction to help parents attend and stay up-to-date with new research, as well as for us to present our own research. Do you have a strategic 5-year plan or do you just ‘go with the flow’? I would say it’s a mixture of both. I have specific goals I try to reach, such as specific numbers of papers I’m aiming for, or fellowships for which I’d like to apply. However, being a young mother means you must also be flexible and take each day as it comes.